The Spanish and Portuguese word tabaco is thought to have originated in Taino, the Arawakan language of the Caribbean. In Taino, it was said to refer either to a roll of tobacco leaves (according to Bartolomé de las Casas, 1552), or to the tabago, a kind of Y-shaped pipe for sniffing tobacco smoke also known as snuff(according to Oviedo; with the leaves themselves being referred to as cohiba). However, similar words in Spanish, Portuguese and Italian were commonly used from 1410 to define medicinal herbs, originating from the Arabic طبق tabbaq, a word reportedly dating to the 9th century, as the name of various herbs. Tobacco had already long been used in the Americas when European settlers arrived and introduced the practice to Europe, where it became popular. Many Native American tribes have traditionally grown and used tobacco with some cultivation sites in Mexico dating back to 1400-1000 B.C. Eastern North American tribes carried large amounts of tobacco in pouches as a readily accepted trade item, and often smoked it in peace pipes, either in defined sacred ceremonies, or to seal a bargain, and they smoked it at such occasions in all stages of life, even in childhood. It was believed that tobacco is a gift from the Creator, and that the exhaled tobacco smoke carries one’s thoughts and prayers to heaven. Before the development of lighter Virginia and White Burley strains of tobacco, the smoke was too harsh to be inhaled traditionally by Native Americans in ceremonial use or by Europeans who used it in the form of pipes and cigars. Inhaling “rough” tobacco without seriously damaging the lungs in the short term required smoking only small quantities at a time using a pipe like the midwakh or kiseru or smoking newly invented waterpipes such as the bong or the hookah (See Thuoc lao for a modern continuance of this practice). Inhaling smoke was already common in the East with the introduction of cannabis and opium millennia before. Prehistory: In 2010, tobacco was found that dates to the Pleistocene Era 2.5 million years ago. Paleontologists from the Meyer-Honninger Paleontology Museum discovered the small block of fossilised tobacco in the Maranon river basin in northeastern Peru. Prehistory: As far as human use of tobacco, although small amounts of nicotine may be found in some Old World plants, including belladonna and Nicotiana africana, and nicotine metabolites have been found in human remains and pipes in the Near East and Africa, there is no indication of habitual tobacco use in the Ancient world, on any continent save the Americas. c. 1 CE: Tobacco was “nearly everywhere” in the Americas. (American Heritage Book of Indians, p.41). The Chiapas Gift, or The Indians’ Revenge? Columbus’ sailors find Arawak and Taino Indians smoking tobacco. Some take up the habit and begin to spread it worldwide. 1492-10-12: Columbus Discovers Tobacco; “Certain Dried Leaves” Are Received as Gifts, and Thrown Away. As each item seemed much-prized by the natives; Columbus accepted the gifts and ordered them brought back to the ship. The fruit was eaten; the pungent “dried leaves” were thrown away. Rodrigo de Jerez and Luis de Torres, in Cuba searching for the Khan of Cathay (China), are credited with first observing smoking. They reported that the natives wrapped dried tobacco leaves in palm or maize “in the manner of a musket formed of paper.” After lighting one end, they commenced “drinking” the smoke through the other. Jerez became a confirmed smoker, and is thought to be the first outside of the Americas. He brought the habit back to his hometown, but the smoke billowing from his mouth and nose so frightened his neighbors he was imprisoned by the holy inquisitors for 7 years. By the time he was released, smoking was a Spanish craze. 1493: Ramon Pane, a monk who accompanied Columbus on his second voyage, gave lengthy descriptions about the custom of taking snuff. He also described how the Indians inhaled smoke through a Y-shaped tube. Pane is usually credited with being the first man to introduce tobacco to Europe. 1498: Columbus visits Trinidad and Tobago, naming the latter after the native tobacco pipe. JAPAN: Dutch and Portuguese trading vessels calling at ports in Nagasaki and Kagoshima introduce tobacco. It is spread through the country over the ensuing decades, often by Buddhist monks, who use tobacco seeds to pay for lodging along the routes of their pilgrimages. 1501: SPAIN: Roderigo de Perez is persecuted by the Inquisition for smoking. 1530: SPAIN: The “roll of tobacco,” precurser to the cigar, becomes popular with the lower classes. 1535: CANADA: Jacques Cartier encounters natives on the island of Montreal who use tobacco. 1548: BRAZIL: Portuguese cultivate tobacco for commercial export. 1555:Franciscan Friar Andr Thevet of Angouleme reports on Brazil’s Tupinamba Indians’ use of Petun. 1558: PORTUGAL: Tobacco is introduced. 1559: SPAIN: Tobacco is introduced by Francisco Hernandez de Toledo, Philippe II. of Spain’s personal physician, who had been sent the year before to investigate the products of Mexico. The seeds Hernandez brings back are at first used only to grow ornamental plants in court. 1560: PORTUGAL, FRANCE: Jean Nicot de Villemain, France’s ambassador to Portugal, writes of tobacco’s medicinal properties, describing it as a panacea. Nicot sends rustica plants to French court. 1571: GERMANY: MEDICINE: Dr. Michael Bernhard Valentini’s Polychresta Exotica (Exotic Remedies) describes numerous different types of clysters, or enemas. The tobacco smoke clyster was said to be good for the treatment of colic, nephritis, hysteria, hernia, and dysentery. 1571: SPAIN: MEDICINE: Nicholas Monardes writes “De Hierba Panacea”, the first book on tobacco. The Seville doctor reports on the latest craze among Spanish doctors–the wonders of the tobacco plant, which herbalists are growing all over Spain. Monardes lists 36 maladies tobacco cures. 1577: ENGLAND: MEDICINE: Frampton translates Monardes into English. European doctors look for new cures–tobacco is recommended for toothache, falling fingernails, worms, halitosis, lockjaw & cancer. 1584-03: ENGLAND: Queen Elizabeth grants Mr. Walter Raleigh a charter for establishing a settlement in America. 1590: BOOKS: Jos de Acosta ‘s Historia natural y moral de las Indias (Seville, 1590) describes the native use of tobacco in detail. 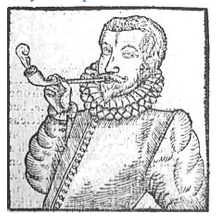 1590: LITERATURE: Spenser’s Fairie Queen: earliest poetical allusion to tobacco in English literature. (Book III, Canto VI, 32). 1590: BOOKS: Richard Hakluyt, who accompanied Sir Walter Raleigh on his Roanoke expedition, publishes his comprehensive anthology: The Principall Navigations. Voiages and Discoveries of the English Nation, Made by Sea or Overland to the Most Remote and Farthest Distant Quarters of the Earth at Any Time within the Compasse of these 1500 Years. 1592-98: KOREA: Hideyoshi Invasion from Japan. Japan, which has maintained contact with Portuguese merchants, introduce the practice of smoking to Korea. An Illustration from Frederick William Fairholt‘s Tobacco, its History and Association, 1859. Following the arrival of the Europeans, tobacco became increasingly popular as a trade item. It fostered the economy for the southern United States until it was replaced by cotton. Following the American civil war, a change in demand and a change in labor force allowed inventor James Bonsack to create a machine that automated cigarette production. This increase in production allowed tremendous growth in the tobacco industry until the scientific revelations of the mid-20th century. 1800s: FRANCE: “Lorettes” — prostitutes near the Notre Dame de Lorettes church–are the first women to smoke publicly. 1800: CANADA: Tobacco begins being commercially grown in Southern Ontario. 1809: SCIENCE: FRANCE: Louis Nicolas Vanquelin isolates nicotine from tobacco smoke. 1818: REGULATION: PA: Smoking is banned on the streets of Lancaster. The first man to break the law and pay the 20 shilling fine is Mayor John Passmore. 1817: BUSINESS: SPAIN deregulates the growing, processing and selling of tobacco. 1822: BUSINESS: SWEDEN: Jacob Frederik Ljunglof begins manufacturing snus. 1823: C. Clement Moore’s 1823 poem “A Visit From St. Nicholas” describes Santa Claus as pipe-smoker. 1824: LA: AGRICULTURE: Acadian Pierre Chenet, nicknamed “Perique”, begins growing the tobacco of the Choctaw Indians commercially in St. James Parish. He also refines the fermenting process for the pungent tobacco. 1826: ENGLAND is importing 26 pounds of cigars a year. The cigar becomes so popular that within four years, England will be importing 250,000 pounds of cigars a year. 1830s: TOBACCO CONTROL: First organized anti-tobacco movement in US begins as adjunct to the temperance movement. Tobacco use is considered to dry out the mouth, “creating a morbid or diseased thirst” which only liquor could quench..
1832: AGRICULTURE: TUCK patents curing method for Virginia leaf. 1833-02-27 RELIGION: In Kirtland, OH, Mormon founder Joseph Smith announces to church leaders that God opposes strong drinks, hot drinks and tobacco. This proclamation becomes known as the “Word of Wisdom,” but considered as counsel or advice, rather than a commandment. 1840: BUSINESS: Miflin Marsh begins Marsh Wheeling Cigars in his Wheeling, WV, home. 1840: Boston, MA, bans smoking as fire hazard. 1843: FRANCE: SEITA monopoly begins manufacture of cigarettes. 1847: ENGLAND: Philip Morris opens shop; sells hand-rolled Turkish cigarettes. 1848: ITALY: “Tobacco War” erupts as Italians stop smoking to protest AUSTRIAN control of the tobacco monopoly. When Austrian soldiers smoke cigars on the street, deadly riots break out. 1852:Washington Duke, a young tobacco farmer, builds a modest, two-story home near Durham, NC, for himself and his new bride. The house, and the log structure which served as a “tobacco factory” after the Civil War may still be seen at the Duke Homestead Museum. 1852: Matches are introduced, making smoking more convenient. 1854: ENGLAND: BUSINESS: London tobacconist Philip Morris begins making his own cigarettes. Old Bond Street soon becomes the center of the retail tobacco trade. 1854: FRIEDRICH TIEDEMANN writes the first exhaustive treatment on tobacco. 1855: J.E. Lundstrom invents the safety match, which requires a special striking surface. 1855: “Annual Report of the New York Anti-Tobacco Society for 1855” calls tobacco a “fashionable poison,” warns against addiction and claims half of all deaths of smokers between 35 and 50 were caused by smoking. 1856: BUSINESS: NORTHERN IRELAND: Tom Gallaher begins a business making Irish roll tobacco in Londonderry. 1856: PEOPLE: James Buchanan “Buck” Duke is born to Washington “Wash” Duke, an independent farmer who hated the plantation class, opposed slavery, and raised food and a little tobacco. 1857: BUSINESS: NORTHERN IRELAND: Gallaher is founded in Londonderry by Tom Gallaher. Later, he moved the firm to Belfast. 1858: Treaty of Tianjin allows cigarettes to be imported into China duty-free. 1860: The Census for Virginia and North Carolina list 348 tobacco factories, virtually all producing chewing tobacco. Only 6 list smoking tobacco as a side-product (which is manufactured from scraps left over from plug production). 1860: BUSINESS: Manufactured cigarettes appear. A popular early brand is Blackwell Tobacco Company’s Bull Durham, which rose to become the most famous brand in world, and gave rise to the term “bull pen” for a baseball dugout. 1861-1865: USA: THE CIVIL WAR: Tobacco is given with rations by both North and South; many Northerners are introduced to tobacco this way. During Sherman’s march, Union soldiers, now attracted to the mild, sweet “bright” tobacco of the South, raided warehouses–including Washington Duke’s–for some chew on the way home. Some bright made it all the way back. Bright tobacco becomes the rage in the North. 1863: SUMATRA: Nienhuys creates Indonesian tobacco industry. Dutch businessman Jacobus Nienhuys travels to Sumatra seeking to buy tobacco, but finds poor growing and production facilities; his efforts to rectify the situation are credited with establishing the indonesian tobacco industry. 1864: CIVIL WAR: The first federal cigarette excise tax is imposed to help pay for the Civil War. 1864: AGRICULTURE: WHITE BURLEY first cultivated in Ohio Valley; highly absorbent, chlorophyll-deficient new leaf proves ideal for sweetened chewing tobacco. 1864: BUSINESS: 1st American cigarette factory opens and produces almost 20 million cigarettes. 1868: UK: Parliament passes the Railway Bill of 1868, which mandates smoke-free cars to prevent injury to non-smokers. 1868/69? : BUSINESS: Allen & Gintner’s Sweet Caporals brand is introduced. 1871: SMOKEFREE: Smoking is banned on the US House floor. 1871: TAXES: The federal income tax, instituted in 1862, is repealed, replaced by liquor and tobacco taxes to finance the federal budget. 1873: BUSINESS: Philip Morris dies. (Yes, that Philip Morris) His wife, Margaret, and brother, Leopold, take over. 1873: Myers Brothers and Co. markets “Love” tobacco with theme of North-South Civil War reconcilliation. 1874: BUSINESS: Samuel Gompers creates the first Union label; persuades a consortium of California cigar makers to apply a label that attest the cigar has been untouched by Chinese labor. 1875: BUSINESS: R. J. Reynolds founds R.J. Reynolds Tobacco Company to produce chewing tobacco, soon producing brands like Brown’s Mule, Golden Rain, Dixie’s Delight, Yellow Rose, Purity. 1875: ART: Georges Bizet’s opera, Carmen, based on Merimee’s novel about a cigarette girl in an Andalusian factory, opens. 1876: Benson & Hedges receives its first royal warrant from Edward VII, Prince of Wales. 1876-11-07: Albert H. Hook of New York City is granted a US patent for a cigarette manufacturing machine. 1880: ENGLAND: BUSINESS: Leopold Morris buys Margaret’s share of the Philip Morris business, and brings in a new partner. 1880s: Cigarette cards, previously only used as stiffeners, begin displaying pictures. 1880s: ADVERTISING: Improvements in transportation, manufacturing volume, and packaging lead to the ability to sell the same branded product nationwide. What can be sold nationwide can and must be advertised nationwide. Advertising agencies sprout like wildflowers. The most advertised product throughout most of the 19th century: elixirs and patent medicines of the “cancer cure” variety. 1880s. BUSINESS: JB Duke’s aggressive saleman Edward Featherston Small hires a cigarette saleswoman, Mrs. Leonard. In .St. Louis, when retailers ignored him, Small advertised for a saleswoman. A petite, thin-lipped widow, a Mrs. Leonard, applied for the job and was accepted. This little stunt gave the Dukes thousands of dollars of free publicity in the local newspapers. 1881: ENGLAND: BUSINESS: Philip Morris goes public. 1881: BUSINESS James Buchanan (“Buck”) Duke enters the manufacturered cigarette business, moving 125 Russian Jewish immigrants to Durham, NC. First cigarette: Duke of Durham brand. Duke’s factory produces 9.8 million cigarettes, 1.5 % of the total market. 1883: US ends the 1862 Civil War excise tax on cigars, helping to usher in a 40-year Golden Age of cigar smoking. 1884: BUSINESS: Duke heads to New York City to take his tobacco business national and form a cartel that eventually becomes the American Tobacco Co. Duke buys 2 Bonsack machines., getting one of them to produce 120,000 cigarettes in 10 hours by the end of the year. In this year Duke produces 744 million cigarettes, more than the national total in 1883. Duke’s airtight contracts with Bonsack allow him to undersell all competitors. 1885: ENGLAND: BUSINESS: Leopold Morris joins with Joseph Grunebaum to establish Philip Morris & Company and Grunebaum, Ltd.
1886: BUSINESS: Tampa, FL: Don Vicente Martinez Ybor opens his first cigar factory. Others follow. Within a few years, Ybor city will become the cigar capital of the US. 1886: BUSINESS: JB Duke targets women with “Cameo” brand. 1887: ENGLAND: BUSINESS: Leopold Morris and Grunebaum dissolve their partnership. Company becomes Philip Morris & Co., Ltd.
1887: BUSINESS: His contracts with Bonsack unknown to his competitors, Buck Duke slashes prices, sparking a price war he knew he’d win. 1887: BUSINESS: Connorton’s Tobacco Brand Directory of the United States lists St. Louis as No. 1 in tobacco output. 1889: USA: ADVERTISING: Buck Duke spends an unheard-of $800,000 in billboard and newspaper advertising. 1889-04-23: BUSINESS: The five leading cigarette firms, including W. Duke Sons & Company, unite. James Buchanan “Buck” Duke emerges as the president of the new American Tobacco Company. c.1890s: INDONESIA: BUSINESS: “Kretek” cigarettes invented. The story is that Noto Semito of Kudus was desperate to cure his asthma. He rolled tobacco mixed with crushed cloves in dried corn leaves–and cured his respiratory ailments. He then Began manufacturing clove cigarettes under the name BAL TIGA (Three Balls). He became a millionaire, but competition was so fierce he eventurally died penniless in 1953.
c.1890-92: IRAN: Tobacco Rebellion, aka Tobacco Riots. Iranian Islamic clergy, angered by the Shah’s “tobacco concession” to England, issue a fatwa banning tobacco use and trade. The resulting public revolt forces the Shah to revoke the concession presages a century of revolts over foreign influence. 1890: BUSINESS: Key West, with a population of 18,786, is the largest city in Florida. Its biggest industry is cigar-making, which employs more than 2,000 workers. 1890: “Tobacco” appears in the US Pharmacopoeia, an official government listing of drugs. 1890: BUSINESS: Dukes establish the American Tobacco Company, which will soon monopolize the entire US tobacco industry. ATC will be dissolved in Anti-Trust action in 1911. 1892: REGULATION: Reformers petition Congress to prohibit the manufacture, importation and sale of cigarettes. The Senate Committee on Epidemic Diseases, while agreeing that cigarettes are a public health hazard, finds that only the states have the authority to act. The committee urges the petitioners to seek redress from state legislatures. 1892: BUSINESS: Book matches are invented, but are a technological failure. Since the striking surface was inside the book, all the matches caught fire often. By 1912, the technology would be perfected. 1893: PEOPLE: Cigar-smoking President Grover Cleveland is secretly operated on for cancer of the mouth. 1893: SCIENCE: Pure nicotine is first synthesized by Pictet and Crepieux. 1893: REGULATION: The state of Washington bans the sale and use of cigarettes. The law is overturned on constitutional grounds as a restraint of free trade. 1894: BUSINESS: By now, Philip Morris passes from the troubled Morris family, to the control of William Curtis Thompson and his family (RK). 1894: BUSINESS: Brown & Williamson formed as a partnership in Winston-Salem, NC,, making mostly plug, snuff and pipe tobacco. (RK). 1894: AGRICULTURE: ZIMBABWE begins growing tobacco. 1895: ADVERTISING: First known motion picture commercial is made, an ad for Admiral cigarettes produced by Thomas A. Edison’s company. 1899: Lucy Payne Gaston, who claims that young men who smoke develop a distinguishable “cigarette face,” founds the Chicago Anti-Cigarette League, which grows by 1911 to the Anti-Cigarette League of America, and by 1919 to the Anti-Cigarette League of the World. 1899: HEALTH: First edition of the Merck Manual is published; it recommends smoking tobacco to treat bronchitis and asthma. 1899: BUSINESS: Benson & Hedges open a tony shop on 5th Avenue in New York City, providing elegant cigarettes for the carriage trade. 1899: BUSINESS: Liggett & Myers taken into Duke’s Tobacco Trust. Duke has finally won the Bull Durham brand of chew. Bull Durham is the most famous trademark in the world, giving rise to the term ‚Äúbull pen‚Äù (from a Bull Durham ad painted behind the Yankees‚Äô dugout), and ‚Äúshooting the bull‚Äù (most likely from chewing tobacco). The bull was advertised all over the world, and even painted on the Great Pyramid of Egypt. 1899: BUSINESS: KOREA: Korea Tobacco and Ginseng (KTG) is founded as a state monopoly on ginseng. The monopoly was expanded to include tobacco in 1921. 1899: BUSINESS: RJ Reynolds Tobacco Company incorporates..
1899: BUSINESS: Pall Mall brand is introduced by Butler & Butler Tobacco Co. in New York.